Grilled chicken fajitas are delicious, but now that we're into October, it's probably time to put the grill away. 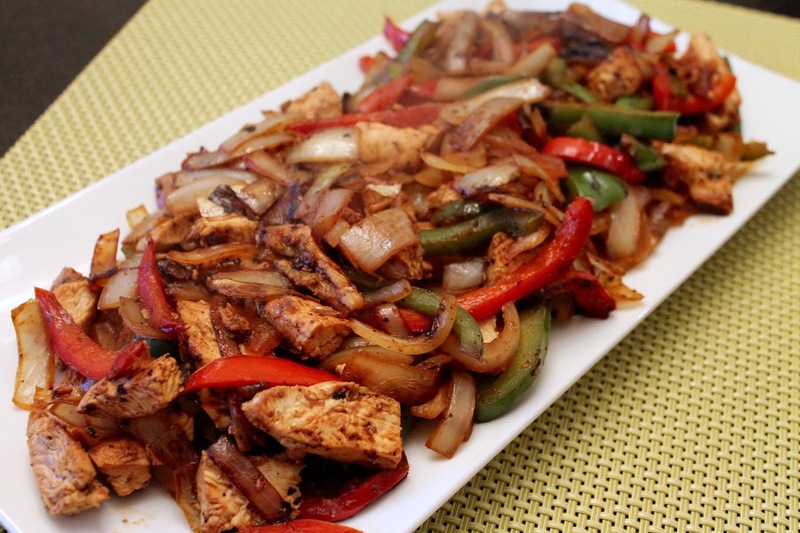 Thankfully, you can make chicken fajitas in your kitchen that are just as tasty. Chris and I are big fans of chicken fajitas, although sadly, lately we've been unimpressed with what we're getting at Tex-Mex restaurants in our area. Consequently, I've been making them at home more often, perfecting an excellent indoor rendition of this grilled classic. Key to this recipe are developing good flavor for the chicken, onions and peppers by both using a flavorful mix of spices and by browning both in a sauté pan. 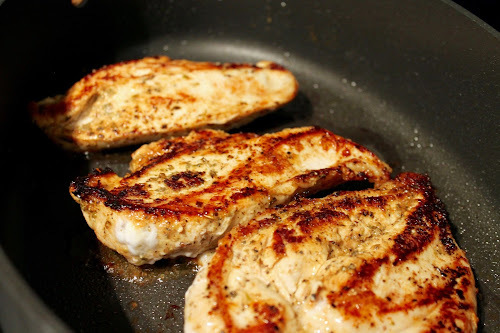 For the chicken, I marinate cutlets in a mixture of spices, lime juice and olive oil. An important step in cooking the chicken and the vegetables is to use moderately high heat and let them both take on some color by not moving them around the pan too much. Both should have nicely browned parts, which leaves a brown residue in the pan. A squirt of lime juice at the end of the cooking helps loosen the browned bits in the pan, coating the fajitas and adding further flavor. You can use any mix of garnishes you like. I'm partial to guacamole and shredded Monterey Jack cheese. 1. Combine cumin, oregano, chili powder, seasoned salt, pepper, juice from 1 lime and 1/4 cup extra virgin olive oil in a gallon-size Ziplock bag. Add the chicken cutlets, seal the bag, and shake to mix the ingredients and coat the chicken. Place in the refrigerate to marinate for a couple of hours. 2. Heat 1 tbsp. olive oil in a large sauté pan over medium-high heat. Remove the chicken from the bag and place in the pan (discard the marinade). Cook undisturbed for about 5 minutes, then turn over the chicken and cook an additional 5 minutes until the chicken is nicely browned on both sides and cooked through. Set chicken aside on a cutting board, allow to cool slightly, then cut into 1/2-inch wide strips. 3. Heat remaining 1 tbsp. olive oil in the sauté pan. 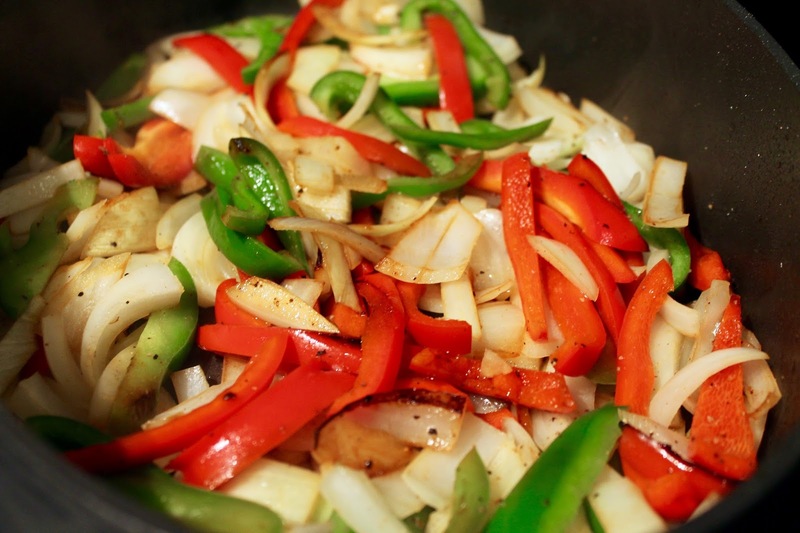 Add the onions and bell peppers and sauté, stirring occasionally, until soft and browned around the edges, about 8-10 minutes. Add the cooked chicken back to the pan. Squeeze the juice from 1/2 a lime into the pan and use a spoon to deglaze and mix in the browned bits on the bottom of the pan. 4. Transfer the chicken fajitas to a platter and serve with warmed flour tortillas and any of the optional garnishes.